In 1988, Alan Smith (aka Smithy) was working in Sydney during the Bicentennial celebrations and setting up a youth hostel in Coogee, when the Queen opened the Stockman’s Hall of Fame in Longreach. Smith had studied hospitality, and the possibilities of tourism in western Queensland intrigued him. Would it grow? Could he become part of it? So he started a survey, asking people if they’d be interested in seeing the Outback. The response was encouraging. The following year, he bought a troop carrier and a camp oven in Blackall and moved to Longreach with, as he says, some big ideas. He’d already registered a company, Outback Aussie Tours. 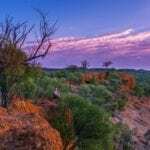 A quarter of a century later, Outback Aussie Tours is a mainstay of the Outback tourism scene, running trips in the Longreach/Winton region as well as the Gulf Savannah, Cape York and across the central and south-west Outback. The company also runs popular sunset and dinner cruises on the Thomson. Smithy was born in Blackall, where he worked in his family’s cordial works before studying in Emerald and working in security in Port Douglas. It was his Sydney experience that convinced him his future lay in tourism. Smithy, 49, is married to Suzan and has four children, all of whom contribute in some way to his cruise and dinner shows on the Thomson. The company employs up to 20 people, including seasonal workers, and last year entertained 6500 tourists at its river camp alone. If you meet Smithy at the camp or elsewhere, he’ll be ready for a yarn and will tell you his outfit wants to do special things for special people. Just the kind of bloke you need to meet, in other words. 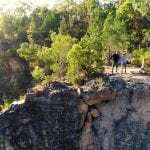 Learn more about Smithy and his successful tourism venture Outback Aussie Tours by clicking here.